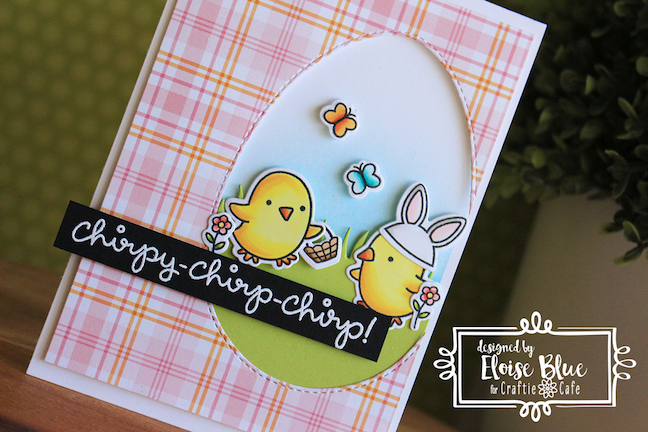 Hi everyone, today I'm here for Craftie Café and for my project I have an Easter card to share with you all. 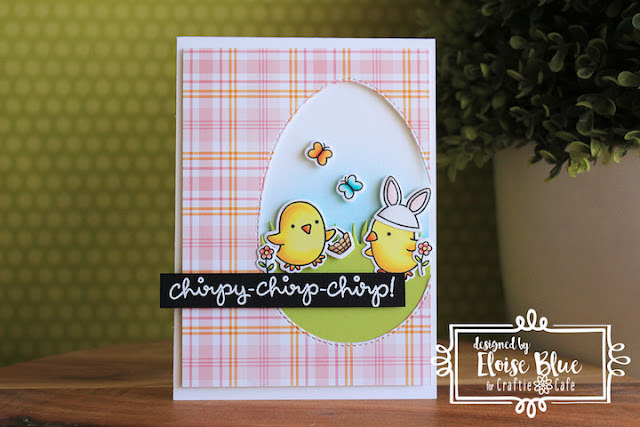 I’ll be using the Chirpy Chirp Chirp stamp set from Lawn Fawn along with Grassy Hillside Borders and some Stitched Egg Dies from Birch Press Design. To begin my card today, I stamped out my images from Chirpy Chirp Chirp using some Jet Black ink from Lawn onto some white cardstock. Then used Copic Markers to colour in my images. Once they were coloured, I used the coordinating dies to cut them out. I set them off to the side and began working on my other elements. I pulled out the Perfectly PlaidSpring Paper Pad from Lawn Fawn and cut it down into a rectangle. Then, I used the Stitched Egg Dies from Birch Press Design – but any egg shape dies would work here and cut the largest size out from the right hand side of my patterned paper. Once that was die cut I used the Grassy Hillside Borders and cut it from a piece of green cardstock. Once that was die cut I adhered it to the back of the patterned paper piece and then added foam tape. Next, I masked off the edges of a card base and ink blended some Tumbled Glass Distress Ink directly onto the base. I removed the mask and then adhered the patterned paper panel over top. I then adhered my images on with foam tape and regular adhesive also inside my egg. Lastly, for the sentiment I cut down strip of black cardstock and white heat embossed the ‘Chirpy Chirp Chirp’ sentiment onto it. Then, I popped it up on more foam tape and adhered it onto my card also. The video is linked down below for you all. So that finished up my card for today, I hope you enjoyed and I’ll catch you all next time. Sweet card! So happy and cute!